Super excited to get the first “REAL” runDisney medal at the Castaway Cay 5K in 2015. The boys ran ahead because Ted is usually faster. 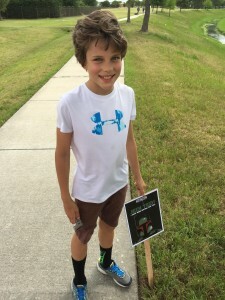 You see, this family convinced their 10 year old son to train for the Star Wars 10k…for months…without him even knowing it! You have to hear the whole story, and you are going to love it. First, Some Background on the Family. Melissa and Jeff Stolasz are just like us. They love to run, they love Disney, and they love to runDisney. They live in Houston, Texas with their 2 children, Sasha (age 12) and Teddy (who just turned 10 this month, which is kind of crucial to the story, Happy Birthday Teddy!). 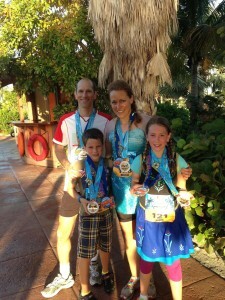 Melissa and Jeff are experienced runDisney runners. Melissa ran the Princess Half Marathon in 2011 as her first ever half marathon (we know a thing or 2 about doing that!). Since then, she and Jeff have run numerous races, even taking turns watching the kids during race weekends so the other could run race challenges. Teddy is convinced the family is “just” posing behind him, nothing to see here, right? 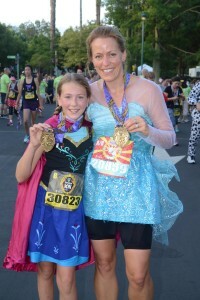 When Sasha and Teddy were little, the family introduced them to running with the runDisney Kids races in Disneyland, and the kids were hooked. The next step were the runDisney 5k races, but the kids, having caught the runDisney bug, soon tired of the rubber medallions, and proclaimed their desire for a “real Disney medal.” OK, fair enough, we know a budding SMO-addiction when we see one. 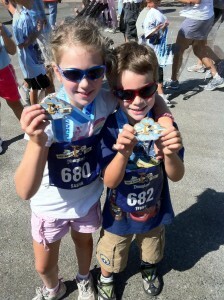 The family ran the Parks to Paradise Challenge in 2015, and Sasha and Teddy were hooked when they received their first “real” metal medals, they wanted more. 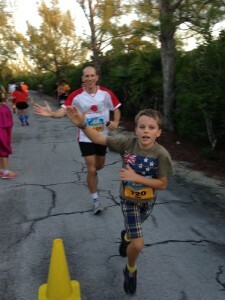 Very first runDisney kids races…ages 7 & 5. 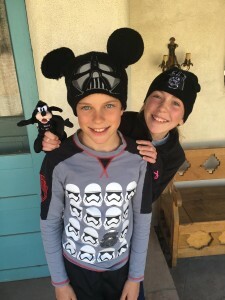 As the minimum age to run a runDisney 10k is 10 years old, Sasha was good to go at any time, but Teddy would have to wait, and would get his first chance to run a runDisney 10k at the Inaugural Star Wars Dark Side Half Marathon Weekend. As a huge Star Wars fan who turns 10 the Sunday before race day, this could not have worked out any better for Teddy. BUT, his family would have a little fun with him first. A real Medal!! Now we’re hooked. How Do You Get a 10 Year Old to Train for a Race Without Telling Him About the Race? To sell the scheme, they needed to name this fake event, and thus the “Houston Hullabaloo” was born. 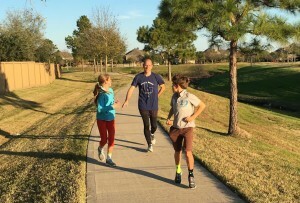 The family told Teddy about the Houston Hullabaloo, then mapped out their training plan. For added fun, unbeknownst to Teddy, the family would document their scheme by taking pictures throughout the training process. Melissa would wear Star Wars clothes on training runs. 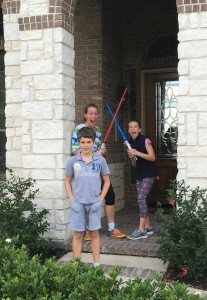 There were occasional light saber battles while Teddy was not looking, and Jeff even carried a Darth Vader mask along on a training running as Sasha mimicked being choked as an errant Imperial Fleet Officer. Will Sasha finally learn the power of the Dark Side? All of this was going on, while Teddy was present, and HAD NO IDEA ANYTHING WAS HAPPENING. Why ever would a 10 year old boy NOT trust his older sister? Sasha actually wore HIS shirt inside out and then whipped it right side out really quickly just before the picture. This is not to say that this was easy. Teddy is a 10 year old, and 10 year olds are naturally curious. He asked his mom if he would be getting a real medal at this race. Fortunately, Melissa was prepared. She had shared her incredibly amusing plot with some running friends from Team runDisney (who Melissa gives a lot of credit to for helping the family pull all of this off), and one of them created a photo of the Houston Hullabaloo medal. Thus, when Teddy asked, Melissa showed him the “real” medal that he would be earning. It is not easy hiding Star Wars props, and a couple of times Teddy nearly ruined the surprise by turning around abruptly during those impromptu staged photos, but Sasha and Jeff were quick to hide their props so as not to ruin the surprise. Remember how we said how 12 year old Sasha was ridiculously instrumental in helping to pull this one off? While the family was doing a training run along the Boardwalk during a Walt Disney World vacation, it occurred to Melissa that they would be running this section during the Star Wars Dark Side 10k race. Not putting 2 and 2 together, she began to remark about this to her family, but Sasha was quick to stop her. It was a close call, but the secret was saved. One of the first “something going on behind him” pics…he has no idea. How Do You Tell Him? 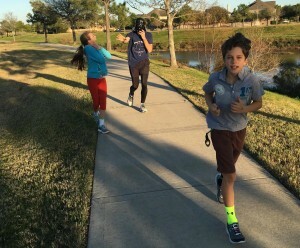 As luck would have it, Teddy’s 10th birthday was this past weekend, to be specific the Sunday before the 10k race, it is also the day the family was scheduled to take on their last long training run. Throughout the entire scheme, the members of Team runDisney offered valuable advice, suggestions, and support which was crucial in pulling it all off, now they were set to take part in the big reveal. Some of the running friends from Team runDisney, especially Kelley, helped the family construct the big reveal by designing signs (themed with appropriate Star Wars references), that the family could place along the route of their final long training run. The only questions left would be: how long would it take for Teddy to figure it out, and would he actually believe them. 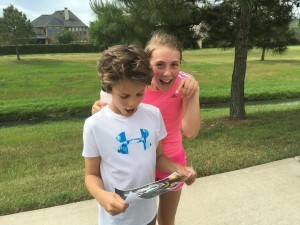 After all, he is convinced that he will be running the Houston Hullabaloo. The thought of going to Disney World never crossed his mind. While we like to think of ourselves here at Casual Runner as storytellers, we think we should let you see for yourselves how the reveal played out. Here is the YouTube video the family put together. Go ahead, you can watch it, but be sure to come back when you are done to get the rest of the story. Now that Teddy knows (and believes!) that, instead of the Houston Hullabaloo he will be joining the Dark Side in Walt Disney World, his dream really is coming true, and his family has one incredible story to share for many years to come. Just as important as pulling off this grand surprise and creating lasting family memories is the way Melissa and Jeff went about conceiving of this elaborate scheme. They could have just told Teddy about the race, but what fun would that be? And would they have wanted to miss out on his reaction when he learned the truth? Absolutely not. But the key to it all is that they went about their plans in such a way as to give Teddy ownership of his own training. Throughout the training, Teddy knew this was about him, he worked with his sister to call the shots in creating the training calendar. 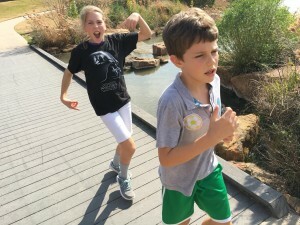 As training involved the run-walk method, the two budding Casual Runners decided what intervals and paces they would run, including the sound effects on their interval timers. 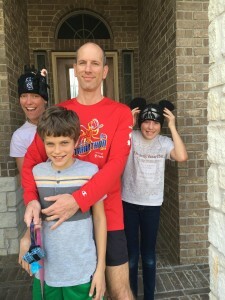 While the fun and the magic of the surprise was very much that of Melissa and Jeff, the training and the life long benefits of becoming a runner are very much Teddy’s. In addition to Teddy’s ownership of this process, Sasha stepped up and developed a uniquely rewarding ownership for her role in delivering a lasting memory for her brother. Needless to say, Melissa and Jeff found a unique and creative way to pass along their love of running to their children, and they did so in a way that created lasting family memories that they will cherish forever. Now why can’t we all think of such great ideas! We will report back and let you know how Teddy’s adventures taking on the Dark Side turn out. If you will be joining us in Walt Disney World for the Inaugural Star Wars Dark Side Half Marathon Weekend, and you happen to see a sign or two about the Houston Hullabaloo, you now know the rest of the story, and make sure you give a shout out to the supporters of Teddy and his family. We all have inspiring stories to share from our own running adventures. Be sure to check out our growing collection of First Mile stories. We would love to add your story to this collection, if you are interested, please let us know.